Having grown up at my father’s furniture store, I worked there through college and ten years after. When Dad starting having trouble getting our elderly cabinet maker to come in to do our touch up and repairs, he asked (ok, told) me to take a class in furniture repair and touch up techniques by one of the companies that makes many of the specialty products that I use today. 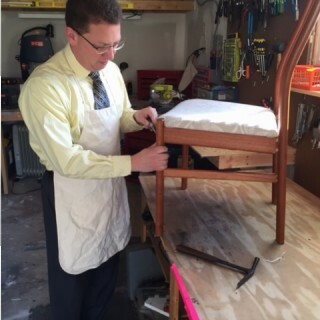 After having a lot of furniture upon which to practice and many years to master the various techniques to hide damage from the eye and create strong, lasting repairs, I branched out on my own after the store closed in 2001 and started the Wood and Leather Doctor. Since 2001, I have made hundreds of new friends delighted with their furniture and cabinetry once again, despite the best efforts from their children, pets, relatives, and others who have accidentally dinged, dented, scratched, broken, and torn their favorite items. I promise to help you fall in love with your furniture once again and earn your business every time. Andrew.